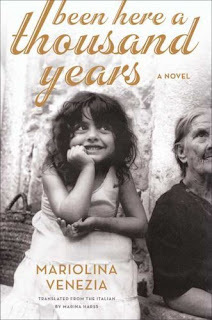 Been Here a Thousand Years is an Italian novel by Mariolina Venezia and translated into English by Marina Harss. It’s a story about five generations of the Falcone family and in particular, the strong women in the family. There is a handy, drawn genealogy chart in the front of the book that you can refer to as you read. The story is told by Gioia (at the end of the 20th century) about the generations that came before her. The book starts on March 27, 1861 (the day Rome was declared the capital of modern Italy) in the town of Grottole, a small town in Basilicata. The opening of the book is about a birth where the mother screams so loud that she breaks storage jars of olive oil which then runs through the streets of the small town. And so the first boy in the Falcone family, Oreste, is born. We later find out that is a bit of a f(l)op. Venezia’s story bounces along a quick clip and she periodically gives a tantalizing peek into some quirky aspect of a character and then leaves it up to the reader to work out possible interpretations and plausible subplots. An example of such a peek is in Chapter 5 when Candida (one of the long line of strong women in the family) finds her uncle in a compromising situation. You are given the sketch but never again is the situation mentioned. Comparison to Christ Stopped at Eboli are apt here because both stories cover the same region and time frame, but the styles are different. In Eboli, more or less autobiographical, Levi spends time fleshing out characters, giving back stories, and describing in detail the relationship of characters to the land. In Thousand Years, Venezia does the same but at much less of a scale assuming readers are familiar with the territory: poor Basilicata farmers dragged into modernity, suffering Fascism, Communism, and 1950s land reform. Venezia's goal, it seems, is to move the plot ahead to sketch out five generations of a family and to reflect on what changes and what doesn’t for the family as they pass through 150 years of tumultuous Italian history. While listening to a story on NPR about an airline for pets called Pet Airways I was struck by someone interviewed in the story who mentioned how his pet was an old family friend – or something to that effect. Well, I’ve grown this jade plant (Crassula ovata) from a leaf cutting and it’s about 18 years old now. Does that qualify as a family friend? It doesn’t lick me or get me up in the morning, but I’m okay with that. This jade has trunk circumference of about 11 inches at the soil line. The height and breath are about 3 feet. It suffered through one winter outside (not a good move, but it was during a remodel) several years ago and one year of absence when, now in retrospect I realize, I gave our plant caretaker bad instructions and it was a bit overwatered. The plant usually spends the 'winter' season (October to April) inside and 'summer' season (May to September) outside. We place it outside in a location that gets some sun but not all day sun. In the picture above it’s on the north side of the house where it gets morning sun and then shade for the rest of the day. 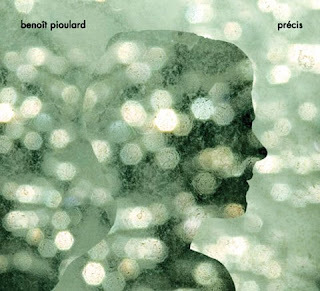 Two new music recommendations from Travelmarx are Patrick Watson’s 2009 release Wooden Arms (listen) and Benoît Pioulard’s 2006 release Précis (listen). Wooden Arms we first heard of on NPR’s Best Music of the Year So Far feature. The segment of the show played the track Beijing and we were hooked. The style of music? 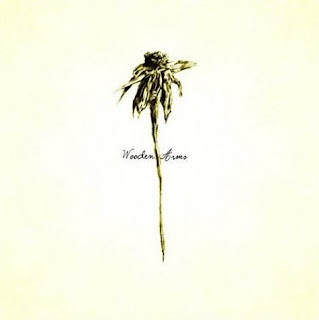 Indie pop and chamber pop with a dollop of dreamy sort of describes it. Check out Watson's site for more info. Précis is a little harder to grasp on first listen. As the review on AllMusic.com notes “Superficial as it can be to judge an album by its artwork, the shimmer and shadow on the cover of Benoît Pioulard's first full-length (and Kranky debut), Précis, aptly depicts the music inside.” The first track La Guerre de Sept Ans is a 3 minute noise experiment that’s sort of a test to see if you can handle the rest of the album. Check out Pioulard's site for more info. We’ve had Amorphophallus bulbifer growing outside for 6+ years now in Seattle. The location is south-facing but with not that much sun due to the neighboring house blocking much of it. We have them arranged in two different 'patches' that roughly experience the same conditions. The plants grow slightly under a house overhang of about 2 feet. The ground is just regular old dirt and the top is covered with hazelnut shells. We water and apply fertilizer during growing season and then don’t do anything off season. We leave the bulbs in ground all year. They keep spreading too - each year more plants show up – due to the bulbils that grow at various node points on the one leaf. We’ve never seen the bulbifer bloom. In one of the photos above there is a plant with a leaf looks like a pinwheel with 10 arms. We don’t know for sure what that is, but our guess is a voodoo lily (Sauromatum venosum). It blooms in late April and then a leaf comes up. The matured inflorescence is pictured below, bent over and hanging close to the ground. Would love to know what it is for sure. A reader (see comments) pointed out that the mystery plant with the pinwheel leave is probably Arisaema consanguineum. I have picture of this year's bloom below and I think that Arisaema is correct. Thanks! 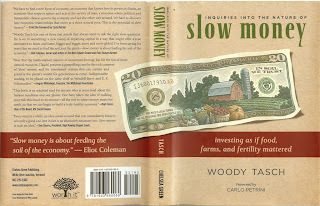 The book by Woody Tasch titled Slow Money: Inquiries Into the Nature of Slow Money – Investing as if Food, Farms, and Fertility Mattered was an interesting read for me because it echoed lots of ideas about our economic system that I’ve often thought about but never could articulate. What’s slow money? It’s the opposite of fast money, it’s place over profit, it’s about thinking, acting, investing, and purchasing locally, and underlying it all it’s about restoring fertility to the soil. It’s easy to agree with the idea(l)s but hard to practice them. Every visit to the grocery store becomes a struggle if you ask about the origin of every item purchased. Forget about investments – who knows the exact location of their investments at any given time? But this is precisely the struggle and questions Tasch wants you to deal with. “Producer is separate from consumer. Investor is separate from citizen. Where we live is separate from where we work. Communication is confused with thought. Tasch weaves in ideas from the Slow Food movement (the founder of the International Slow Food movement Carlo Petrini wrote the foreword), from E.F. Schumacher (economist and author of Small is Beautiful: Economics as if People Mattered), Wendell Berry (farmer and writer), and Eliot Coleman (farmer and educator) to name a few. If you think that this sounds like a book that is anti-capitalism, I’ll leave you with this interesting quote from chapter 2 where Tasch is quoting Tom Miller, the first CEO of the Kentucky Highlands Corporation. “We are not trying to reign in or correct or punish capitalism. We are trying to complete it. A pleasant surprise for our one day visit on the north part of San Juan Island was the Westcott Bay Sculpture Park. The park is a 19 acre area with over 100 sculptures. As you wander through different micro-eco zones of the park you will discover sculpture hidden in patches of tall grass, under and in trees, and in the middle of a pond! We didn’t like every piece, but as a way of enjoying sculpture and especially outdoor sculpture (which can get weird at times) the park is a success and worth a visit. The park is a few minutes from Roche Harbor (park location) and you can visit the AfterGlow Vista Mausoleum before or after. The AfterGlow Vista Mausoleum is located on San Juan Island, a 15-20 minute walk from Roche Harbor located here. The mausoleum was built by John S. McMillin as a memorial for his family and all things in which he believed. McMillin made his money in the late 19th century and early 20th century in lime and cement. Lime was used and still is in many common industrial processes and was obtained on the island by heating limestone. McMillin was part of the Masonic Lodge, a Methodist and Republican and the mausoleum contains all sorts of symbols and saying reflecting beliefs contained in aforementioned belief systems. You will see a lot of the Masonic square and compass. One purposely unfinished column in the mausoleum symbolizes the “unfinished state of man’s work when the string of life is broken.” Heavy stuff. The mausoleum is worth a visit if not to walk among the tall trees in the wooded graveyard leading up to the mausoleum. A good itinerary is to visit the Westcott Sculpture Park and the mausoleum together as a morning or afternoon excursion. The exhibit Andrew Wyeth: Remembrance at the Seattle Art Museum runs from June 25th to October 18th, 2009. 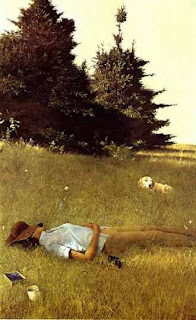 Andrew Wyeth (1917-2009) is considered a realist and regionalist painter. From the remembrance here (six or so paintings) you’ll get a sense of that. There is a meditative quality about his work that we found pleasing. In stark contrast to Wyeth, head up a few floors to the exhibit Target Practice: Painting Under Attack 1949-1978 running from June 25th to September 7th, 2009. This exhibit is figuratively and literally about how painting was attacked after World War II as artists around the world looked for ways to break the conventions of traditional canvas painting. In some works, artists literally break apart paintings, in others (like one by Yoko Ono) you are invited to participate in the art work by hammering a nail into the canvas, and still in other works, painted canvas is draped like curtain swags. The French artist Niki de Sainte Phalle (1930-2002) shot her paintings…repeatedly. The tools used for working the paintings are humorously summarized in the exhibition poster shown below. There’s a lot to see in this exhibit and it’s worth the time. A big bonus is that the free audio guide is narrated by Laurie Anderson. The Italian connection: one featured artist is the Italian painter and sculptor Lucio Fontana (1899-1968). 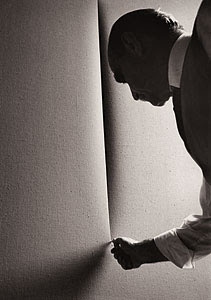 The famous photo of Fontana by Ugo Mulas slashing (oops, working the canvas) says it all.